SEATTLE--(BUSINESS WIRE)--Aug. 25, 2016-- (NASDAQ:AMZN) – Amazon today announced Amazon Vehicles, a car research destination and automotive community that makes it easy for customers to get the information they need when shopping for vehicles, parts, and accessories. 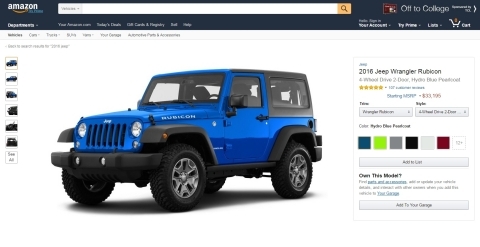 With Amazon Vehicles, customers can now view specifications, images, videos, and customer reviews for thousands of new and classic car models on Amazon.com, including everything from the 2016 Jeep Wrangler and 2014 Tesla Model S to the 2000 Chevrolet Corvette and 1965 Ford Mustang. Research Tools: Customers can now view comprehensive detail pages complete with specifications, images, videos, and customer reviews for thousands of new and classic car models. Finding cars on Amazon Vehicles is simple – just search like you would any other product or browse by year, make, model, customer rating, MPG, towing capacity, and more. Customers can begin researching vehicles today at www.amazon.com/vehicles. One-Stop Shop: Amazon Vehicles is an extension of the Amazon Automotive store, which enables customers to add information about their current car to the Amazon Garage for shopping parts and accessories designed specifically for that vehicle. To-date, more than 35 million customers have saved their car(s) to the Amazon Garage. The Amazon Automotive store features millions of products from categories spanning Replacement and Performance Parts; Automotive, Truck, Motorcycle, and Powersports Accessories; Car Care; Tools and Equipment; Tires and Wheels; Car Electronics; and Enthusiast Merchandise, among others. Customers shopping for parts and accessories in the Amazon Automotive store will find the same features they have come to know and love from Amazon, including fast, free shipping options – guaranteed unlimited Free Two-Day Shipping with Amazon Prime and Prime FREE Same-Day Delivery seven days a week in 27 metro areas – helpful customer reviews, personalized product recommendations, and best-sellers.